What does a truss rod do? A truss rod is something that helps straighten a neck. You will normally find one in any instrument that has steel strings. Strings can put a lot of tension on a neck, easily 80kg on acoustics, and cause it to bow and make it look like something Robin Hood would use. Changing what gauge strings you use will likely mean you’ll need to tighten or loosen your rod. This bow, depending on the direction, makes the strings far from or too close to the fretboard and makes a guitar very hard to play and can put it out of tune or buzz as you fret. There are different types of truss rods. Early truss rods were non-adjustable, just bars of metal put under a fretboard. Some companies still use non-adjustable rods either on their own or with adjustable ones but these are mostly made of carbon fiber to keep weight down. The main type you will find in most guitars today are adjustable and made from steel. There are different types but all work in pretty much the same way. Some are dual-action, meaning they will bend, either way, some are placed in a curved slot, some are a ‘troth’ of metal with the rod placed inside. For adjusting, the main two things you need to know are, where to adjust it from and what tool you need. It will either be at the headstock or the bottom of the neck. And you will need and socket or a allen/hex key. Do you need to adjust your rod? The first thing to find out is whether you need to start tweaking your rod. Lots of people think a high action can be fixed by tightening a rod when the problem is a high nut or saddle. Also, some people like more relief in the neck and want a slight bow so to be perfectly straight isn’t always right. Always make adjustments with the strings on and tuned to pitch. The first two things I do is sight down the neck, looking from the headstock down one edge of the fretboard focusing on the frets. Next check the other side of the fretboard. If one side they line up and not the other you have a twist in your neck. That is, unfortunately, a bigger job and probably best to take to a professional. If they look straight and line up nicely it’s unlikely the truss rod is your problem. From there you can go on to check nut, saddle, frets etc. Another way of checking is using the string as a straight edge. 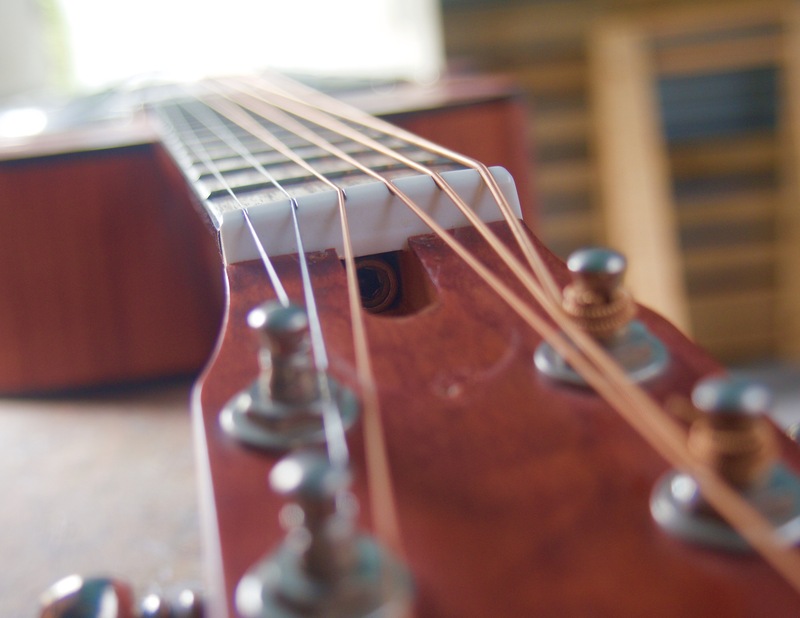 Using a finger or a capo, fret the low E string on the first fret. Next, keeping the first fret pushed down, push down on the last fret on the same string where the neck joins the body. I like to use my thumb. Typically this fret will be the 15th for acoustics and 17th for electrics. Ideally, with both these frets pushed, you want your string to be just hovering over the 7th and 8th fret, not touching. I like to push down at these middle frets so only the lightest touch will connect the string to the fret. Repeat this on each string. If all your strings are just hovering over the fret you’re good, leave that rod alone. If they are touching the frets, back-bow, you’ll be needing to loosen the rod. If they are miles away, up-bow, it will need tightening. If the low E is touching but the high E is far away your neck is likely to be twisted. How to adjust your rod? So you have checked and you have a bow. Get the tool appropriate for your instrument, this will be a socket or a allen/hex key, and see if your nut for adjusting is at the headstock or the body end of the neck. If it’s at the headstock there may be a cover that will need removing. Then establish which way you’ll need to turn. If you have an up-bow you will be turning clockwise, and for a back-bow anticlockwise. Turn in very small amounts and keep track. I turn a quarter turn at a time checking string hight after each turn. If the nut feels tight then stop. It should not take lots of effort to turn. As well as snapping a rod another common problem can be stripping the threads. If it feels tight simply take the nut completely off and clean and grease the threads. Then put the nut back on and have another go. Once you have the neck straight, or with the amount of relief you want, leave it for a few hours or a day. Check it again and adjust as necessary. If your neck has a big bow you can leave it a few hours before each half turn or so. This will make sure there is not too much stress on the rod or neck and allow the wood to move the way it wants. Hopefully, if you are nervous this will give you confidence and make sure that your guitar is playing at its best. It is a straightforward thing and not as scary as people make out. It can also make a huge difference to your playing both in enjoyment and ability. Happy playing!